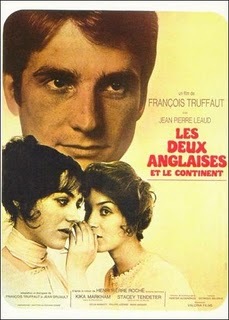 • Two English Girls: Anne (Kika Markham) paying Claude (Jean-Pierre Léaud) the forfeit, a kiss through a chair-back: in the spectacles of the onlooking Muriel (Stacey Tendeter), the firelight burns a demonic red; she turns her gaze away and the light goes out; Truffaut fades before the kiss…. • The first time in Such a Gorgeous Kid like Me when the night club singer (Guy Marchand) beds down with the gorgeous kid (Bernadette Lafont): we cut outside his dressingroom and the soundtrack roars with his record of the Indianapolis Speedway (the second time Truffaut uses it, it falls rather flat)…. • The late Robert Ryan’s voice breaking—he turns his face from the camera—as he drops his conspirator role for a moment and quotes: “For God’s sake, let us sit upon the ground, / And tell sad stories of the death of kings…”; character and narrative tone arc both violated, yet this moment suggests more about the real meaning and power of Executive Action than the colorless machinations of the filmmakers or the conspirators throughout the rest…. • Walter Matthau making a deal with Sheree North in Charley Varrick: every line they exchange, the price goes up…. • The Long Goodbye: Marlowe (Elliot Gould) and Eileen (Nina Van Pallandt) struggling in the surf while the white smudge of Roger Wade (Sterling Hayden) recedes further and further into the Pacific: the viewer participates in the struggle in proportion to his own desperation to keep that white shirt in view…. • Alan Price’s song interludes in O Lucky Man! : Price’s large but not unconfined talent and his very personable presence are exactly right for keeping these scenes separate from and yet sharply related to the “story” material that surrounds them…. • Max’s alternative to fighting in Scarecrow: an impromptu striptease—the barroom community gets solidly behind him while Lion looks on, lost in shadow…. • Marlowe offering a cigarette to “JoAnn Eggenweiler,” whose face is frozen in plaster and brass: when she declines, Marlowe mumbles, “It’s OK with me, lady”—The Long Goodbye…. • Images: The next morning, Cathryn comes downstairs; the bloody body of Marcel (Hugh Millais) is still there, where she stabbed him; she passes into the kitchen without a glance, more comfortable with her fantasies than the audience is prepared to be…. • Pat Garrett and Billy the Kid: Billy rides past a pond at twilight; his silhouette is swallowed up by that of a rise of ground while his reflection remains visible: his existential reality will go down to darkness and oblivion, but what he stands for will not…. • Claude meeting Muriel again after some years, Two English Girls: they confront each other against the side of the ship that has brought her, ripples iridescing over all. They part the next day between trains, the forces of their lives at once seeming to draw them apart and hold them orbitally locked to each other…. • Scarecrow: Remembering the sawbuck he keeps in his shoe, Max takes it off and begins—pleasantly—to pound the heel open, while the airline clerk looks on with mounting apprehension; the audience knows, as she does not, that Max’s violence is nicely under control: he will survive…. • While cattle low in the distance and a slant of golden sunlight dies along a verdant slope, Maynard Boyle (John Vernon) quietly slips the bureaucratic shaft to Harold Young (Woodrow Parfrey), setting him up to take the fall—Charley Varrick…. • And from the same film, the moment when Garrett pauses, on his way to history’s rendezvous, to offer a drink to a man crafting a baby’s coffin. It is Sam Peckinpah. He refuses the drink. And he says, “So you finally figured it out. Go on, get it over with.” And they do….